Here's what I believe: changing the number of categories and the definitions of violence doesn't touch what is really wrong with the procedures for reporting violence in schools. Principals still will not want to expose themselves by submitting any reports on the students who misbehave, because reporting that you have bad students is bad for your buck, reputation in the neighborhood, sponsorships, and alot more. On the other side of the coin, pinning a violent event committed by "bad" students, on a teacher instead, gives you many opportunities for acclaim by the media, parents and anti-tenure organizations. See something wrong with this picture? The solution is to take away from in-house personnel, including administrators, the right to rule on the reporting of violence, and give any staff member the right, with immunity, to report assaults, crimes and or damages to people or property to a special division of the police, who must investigate without interference from principals trying to coverup their mistakes and their "little angels" (sometimes gang members well known to the community). And for pete's sake, get everyone covered by Workers' compensation. Stop principals from arbitrarily and randomly denying LODI (line-of-duty-injury). New York State education officials voted Tuesday to change the way the state tracks school violence, hoping to improve a system that has been called confusing and inaccurate. But because the system will continue to rely on schools to report data, it may not offer a clearer picture of how dangerous the schools might be. The old Violent and Disruptive Incident Reporting system, or Vadir, tracked offenses across 20 categories, including homicide, kidnapping, bomb threat and riot. Schools reported episodes based on guidelines from the state. Under the new regulations, approved by the Board of Regents, the state’s highest educational authority, state officials have whittled the categories to nine and tried to clarify definitions so schools report episodes more accurately. A Vadir score can be enormously consequential because if a school has a certain level of episodes two years in a row, it can be labeled “persistently dangerous,” a designation the federal government requires states to make, and one that means students who request a transfer must be offered a place at another school in their district. A frequent complaint was that the persistently dangerous formula, which is the ratio of violent encounters to enrollment, puts small schools at a disadvantage. Five major episodes at a school with 100 students, for example, comes across as more problematic than five episodes at a school with 500 students. 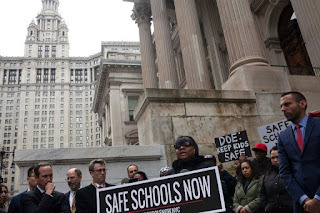 David Goldsmith, the president of the Community Education Council for District 13 in Brooklyn, said there had been small schools in his district on the persistently dangerous list that he thought did not belong there. But some critics now wonder if the system has moved too far in the other direction. Among them is Families for Excellent Schools, a pro-charter-school group that is suing New York City for what it says are violent conditions in city schools. Jeremiah Kittredge, the chief executive of the organization said that by removing and collapsing categories, the state would give families less information about what’s going on in schools, not more. Ms. Rider of the State Education Department said New York would still make some of that information available in subcategories. The changes do not remove what many see as the most fundamental problem: Vadir is based on self-reported information, and given that the reporting has consequences, school administrators might have an interest in keeping certain episodes to themselves. For example, “assault with physical injury” and “assault with serious physical injury” will now become a single category, called “physical injury.” Categories like “reckless endangerment” will disappear. “You don’t have to be a lawyer anymore to understand how to report things,” Ms. Miller said. The new regulations will take effect in July. One thing that will not change is the formula for determining whether a school is persistently dangerous. So to try to keep small schools from being unnecessarily branded with that label, Ms. Rider said, the department plans to review any school that is flagged but has fewer than 250 students. Even before Tuesday’s vote, the state had taken action to reduce the number of schools on the persistently dangerous list. At the start of the 2015-16 school year, there were 32 schools on the list. This year, there were five. Ms. Rider said that last year, the department started working intensely to help manage student behavior at schools that had one year of data with a high number of episodes, putting them in danger of ending up on the list the next year. Schools were also given more guidance on how to report disruptive behavior. Schools kept in regular contact with the state, Ms. Rider said, and some 70 sessions were offered last year to teachers, principals and district staff members on interventions, investigation and reporting. Ms. Rider said schools were not instructed to report fewer episodes or to downgrade their severity to create a more flattering portrait. “That did not happen,” she said. Ms. Rider said that changes in how educators at all levels thought about discipline and misbehavior had also played a role in reducing the number of episodes reported. Schools and districts around the state have been moving away from suspensions and toward practices like restorative justice, which encourages getting to the source of outbursts rather than just sending students out of the classroom. She also said the state planned to expand this holistic view of student behavior on the measurement side as well. This year, the state is testing a new School Climate Index in seven schools. It will look at information like Vadir data, rates of absenteeism, and school surveys from parents, teachers and students. Mr. de Blasio’s figures are drawn from a database that is collected and reported by the New York Police Department. Toya Holness, a spokeswoman for the Education Department, said those figures track any occurrence in which a member of the Police Department is involved, whether a uniformed officer or a school safety agent. If an episode is witnessed by a classroom teacher but does not reach the school safety agent, it is not included. By that count, the total number of recorded episodes dropped slightly, to 6,875 in the 2014-15 school year from 6,950 the year before. During the same period, reports of “seven major felony crimes” fell to 614 from 654. In the 2000-1 school year, by contrast, there were 1,575 of those major crimes reported. In claiming that schools are increasingly violent, Families for Excellent Schools relies on data from New York State. Those figures are collected by school administrators and might include classroom incidents that are not included in the Police Department’s numbers. This city data is then reported to the state, Ms. Holness said. Based on that data, the complaint says the number of violent episodes rose 23 percent in the school year ending in June 2015 from the previous year. The validity of the state data has been widely criticized, not least by the federal education secretary, John B. King Jr., when he was New York State’s education commissioner, who said that it “rarely reflects the realities of school health and safety.” Critics have said that the state’s system does not differentiate enough between minor infractions and more serious complaints, and that because the data are not verified, it is difficult to know whether schools are accurately reporting violent situations. A task force is working to revise the system. Nonetheless, the individual claims in the lawsuit were troubling. 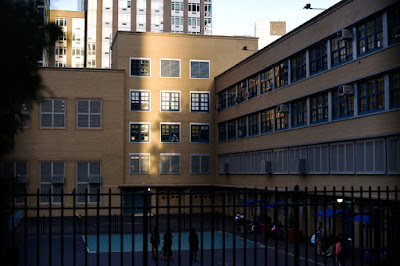 One student, a 9-year-old boy at a school in West Harlem, is said to have been grabbed by the ear by his math teacher, who “dragged him down the stairs and threw him onto a landing,” according to the complaint. An 11-year-old girl at school in Chelsea was bullied and assaulted for years by another student, who then began to attack her 7-year-old sister. The Education Department “refuses to discipline or transfer” the bully, the suit said. The suit asks the city be compelled to devise a plan to address issues of violence and harassment, and asks the court to appoint an independent monitor to oversee the Education Department’s efforts. New York, NY – Families for Excellent Schools' CEO Jeremiah Kittredge released the following statement in response to a news report of a Brooklyn student who was hospitalized yesterday with third-degree burns after a fellow student lit her hair on fire.